Guards will forgive any bounty of less than 2000 gold (once per hold). 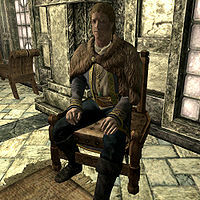 The jarl asks you to purchase a house in the city (if the hold has a major city). ^a If Season Unending has been used to change the jarls of holds, the new jarls will allow you to become thane without completing any other prerequisite quests, with the exception of the Jarl of the Rift. ^b All honorary weapons listed are randomly assigned enchanted melee weapons. More information can be found on this page. ^c Dragon Rising grants Thane status by itself. There are no further requirements to become Thane of Whiterun if Balgruuf is still Jarl of Whiterun, and there is no other way to become Thane of Whiterun while he is Jarl. ^d Elisif the Fair remains Jarl of Haafingar even if it is conquered by the Stormcloaks. Esta página foi modificada pela última vez à(s) 22h31min de 12 de setembro de 2014.